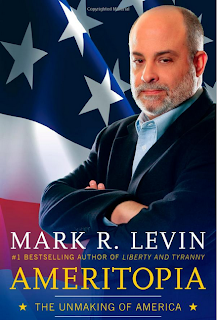 Along with being both timely and timeless, the critical importance of Mark Levin’s latest, Ameritopia: The Unmaking of America, rests in its unique ability to empower and inform the Conservative, or activist, political junkie, and average citizen with a genuine interest in contemporary American politics. Timely because it cuts to the heart of the political struggle playing out in 2012, timeless in that it’s a concise yet thorough primer addressing the two core philosophies that drive all American politics, the depth of understanding of both Liberalism and Conservatism and the critical struggle between them it provides represents a wealth of information and insight to empower the Conservative and political activist of today. From government in general, to the particulars of the American experiment embodied in our Declaration of Independence and Constitution, Levin extensively quotes unique and important thinkers, such as Plato, More, Hobbes and Marx on behalf of the utopianist view; with thinkers like Locke, Montesquieu, de Tocqueville and others representing the individualist, or Conservative view as we know it today. Interspersed with extensive, insightful commentary by Levin himself, one comes to understand the bedrock, theory and practice of two very different political ideologies and how they apply to contemporary American politics playing out on a day-to-day basis, as well as in every election year. Broadly at issue is, how will man structure himself, so as to function within a society. The utopianist would hold that said society must be structured from the top down, with rules, roles, regulations and laws all purportedly designed for the common good being issued from on high. The individualist, free-thinking, or conservative view would hold that, at the core of all civil society rests the individual, with his natural rights and inclinations, both good and bad, the ideal society being represented by a governmental authority that manifests the least amount of control possible, so as to empower the freedom, happiness and productivity of the individual. By tracing the development of these two critical schools of thinking from their earliest beginnings, in theory, practice and thought, following them right up to today, one comes to understand American society as existing within a polarity between the two competing schools, with every political decision, be it a vote, or government mandate, as impacting precisely where within said polarity an American must live out his, or her life every day.